Age 88, Passed away peacefully surrounded by family on March 24, 2019 from Alzheimers disease. 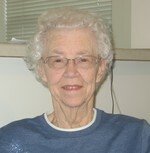 Lorna was a faithful card sender and letter writer, talented baker and lefse maker, active within her church and at Luther Dell. She was preceded in death by husband John. Survived by 4 children, Susan, David, Jennifer (Tom) and Paul; 5 grandchildren, Hannah (Casey), Brian, Charlie, Ayla (Tony) & Cody; 2 great-grandchildren Kylie & Lorelai. Also survived by sister Hazel Holthuson. Funeral Service 11:00 a.m. Friday March 29, 2019 at BETHESDA LUTHERAN CHURCH 2855 47th St E Inver Grove Heights. Visitation 9:30 to 11:00 a.m. Friday, at the church. Interment General Lutheran Cemetery. Memorials preferred to church or Neighbors, Inc.